Get the best value for money when you explore Europe with McLachlan European Holidays. There has never been better value for your money than when you explore the wonders of Europe with McLachlan European Holidays. In conjunction with renowned UK partner, Leger Holidays, Europe’s greatest destinations are now yours to experience at a level of comfort that you didn't know you could afford. Enjoy the journey! Joining an escorted tour not only gives you the benefits of visiting many fantastic destinations throughout Europe, and across the world, but also the undeniable ease of having everything taken care of for you. With expertly crafted itineraries and a range of excursions to choose from, McLachlan European Holidays will make sure your holiday will be hassle-free from the very start. McLachlan European Holidays has chosen to partner with Leger Holidays who have custom-designed the most comfortable fleet of coaches in Europe. Plus, on your Silver Service or Luxuria holidays, you will also receive porterage at your hotels, at no added cost. All you have to do is sit back and relax as everything is taken care of for you. Whether you choose a coach holiday, Grand Explorer, short tour, festive break or a single-traveller holiday, the priority is to make sure you have a truly unforgettable experience. 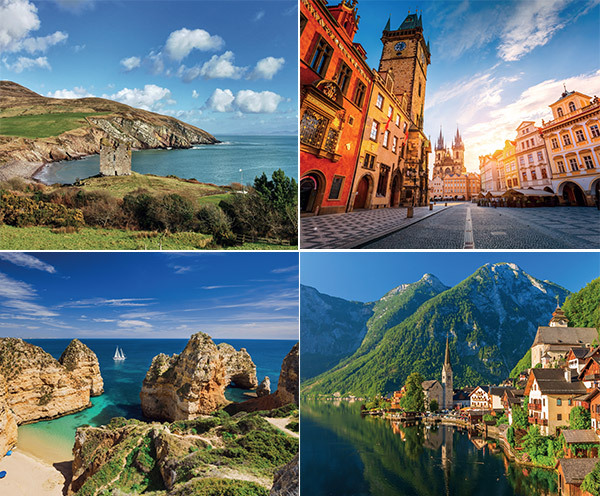 From world-famous destinations to the unusual hidden gems, McLachlan European Holidays will be with you as you experience the wonderful, the fascinating, the breathtaking and the extraordinary. McLachlan European Holidays' knowledge and experience will leave no stone unturned in the pursuit of your perfect holiday. On all holidays featured in this brochure, you have the option to join the tour in the UK at one of the many convenient coach joining points, or choose to meet up with your fellow passengers at the first overnight hotel. You are welcome to start in the UK and finish in Europe, should you wish to continue your travels or return home directly. Throughout your tour, you will be fully escorted by experienced members of the McLachlan European Holidays team. Seeing the best sights is easy as many of the excursions are included in the price of your holiday. You can also choose to enhance your experience by joining a range of fascinating optional excursions, at an additional cost. With the insight of expert guides and the attention to detail put into perfecting your itinerary, your time will be used to its full potential meaning you simply won’t miss a thing. McLachlan European Holidays always makes sure that, when booking your holiday, you get the best value available. With many of your excursions, visits and meals included, you can be assured that your money will go further on a McLachlan holiday. You can rest assured that your money is protected by McLachlan European Holidays' membership of ATAS and CATO, giving you total peace of mind and complete financial security. McLachlan European Holidays is part of a family travel company that has been helping Australian travellers to explore the world for nearly forty years. There is no better team to bring you the holiday of lifetime!